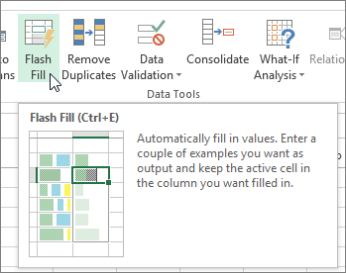 Flash Fill automatically fills your data when it senses a pattern. To use it, see Using Flash Fill. However, if you're on a Windows device, you may need to enable this feature before using it. 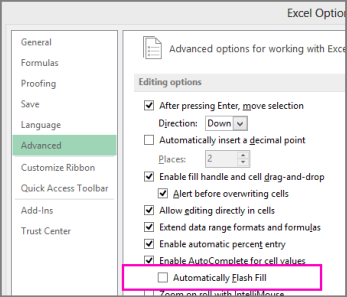 Click the Advanced in the left pane, and ensure that the Automatically Flash Fill box is checked. If you know that Flash Fill is enabled, but still doesn't work, then you can start it manually by clicking Data > Flash Fill or Home > Flash Fill. You can also press Ctrl+E on the keyboard.